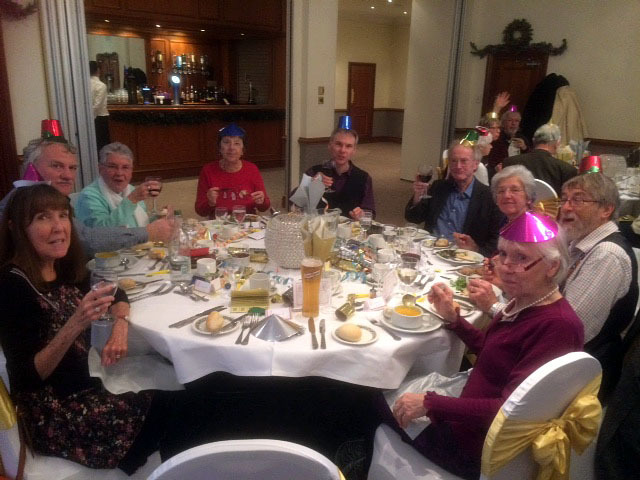 The annual bash was attended by 37 people and a good time was had by all. The "mega raffle" was a delight as usual. Robin won the coveted Christmas cake which is now an institution. Thanks to Judith Weeks for another masterpiece. 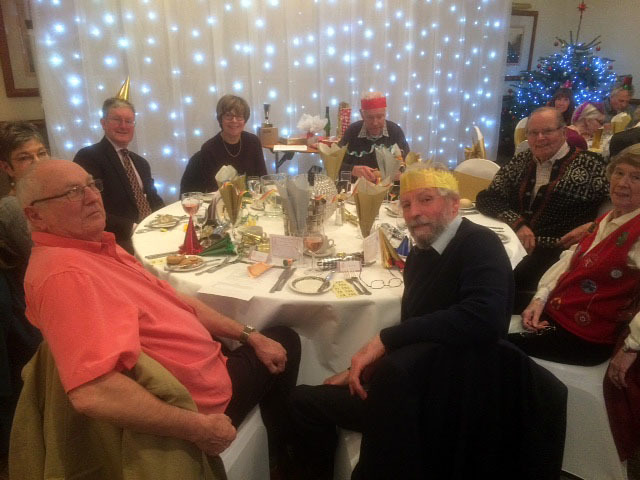 After lunch, the annual presentation of the Brooklands Centre trophies took place: The out and about trophy was won by Susan Perkins for participating in the most events during the year. The club person of the year was won by Colin Weeks for successfully taking over the organisation the Cobham Trial. The John Oliver Trophy was won by Roger Brown for his work keeping the clubs website up to date. 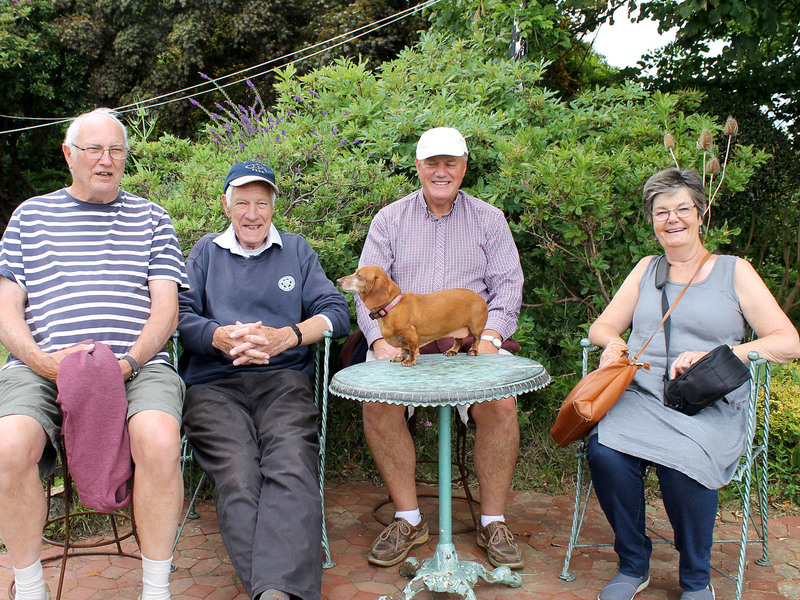 Ten of us met on Wednesday for a morning walk followed by a pub lunch of our usual clubnight. 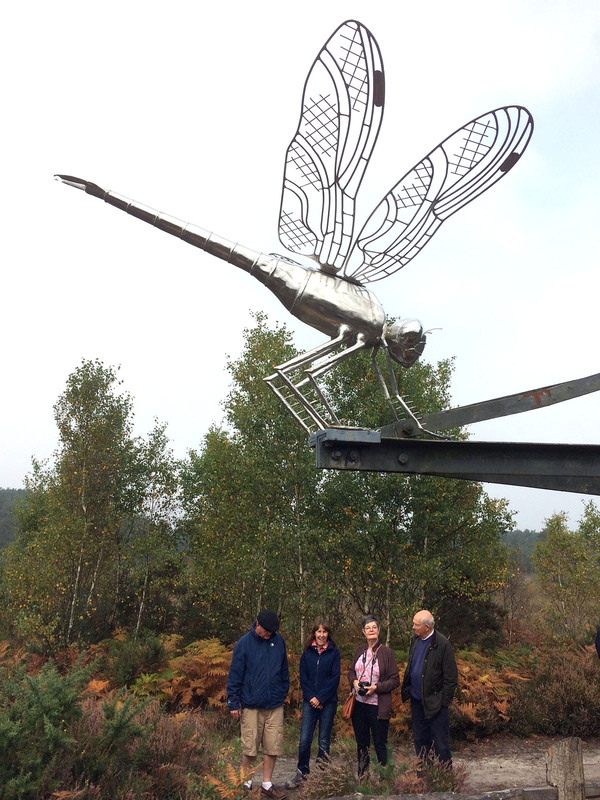 We met at Elstead Moat car park and walked for an our on the Dragon Fly Trail, mostly on boardwalks and some on Thursley Common. There was not much dragonfly activity at that moment, but a very enjoyable and easy walk before a lunch in the garden of Elstead Mill. 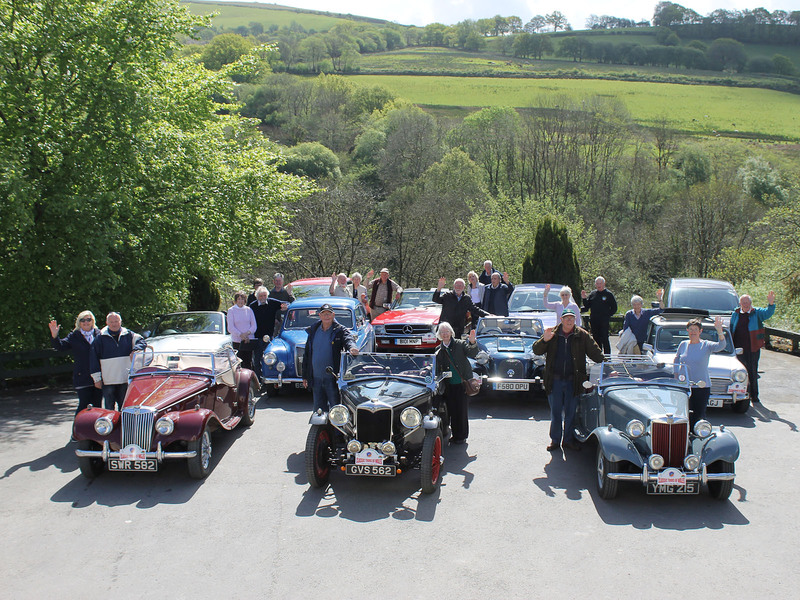 29 people in 14 old cars (7 Austins) from Brooklands Centre set off to the Isle of Wight for a weekend break. 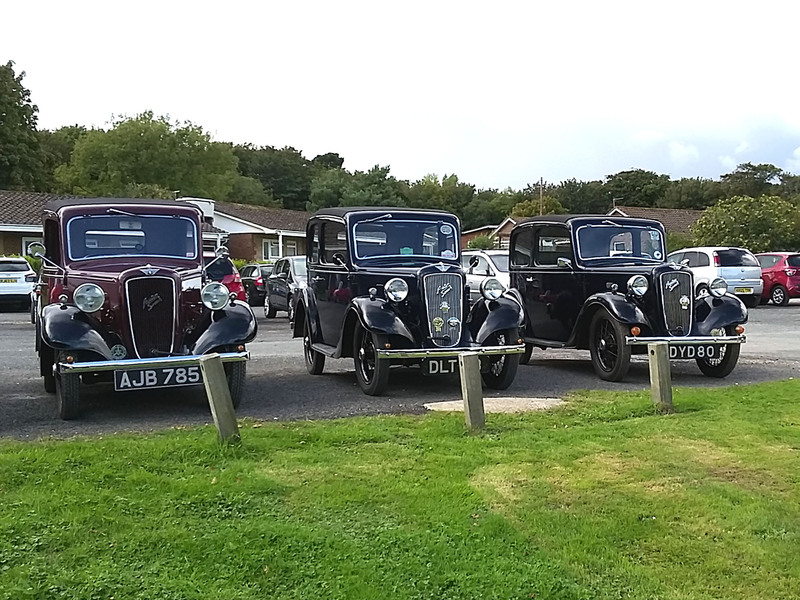 We met members from the South Hants Vehicle Preservation Society who were also staying at the same resort. 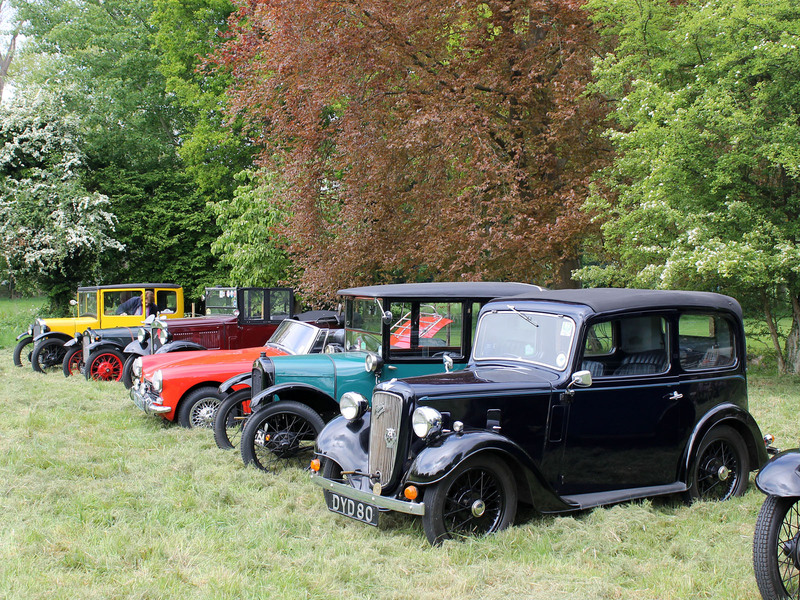 Every year cars are invited to take part in the two day, I O W Classic Car Show. 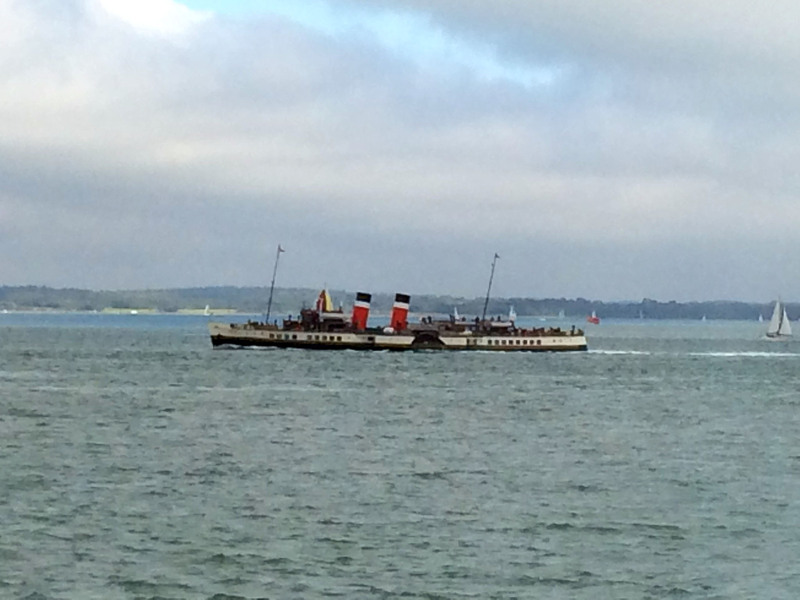 It was held at Newport on Saturday and Ryde on Sunday. 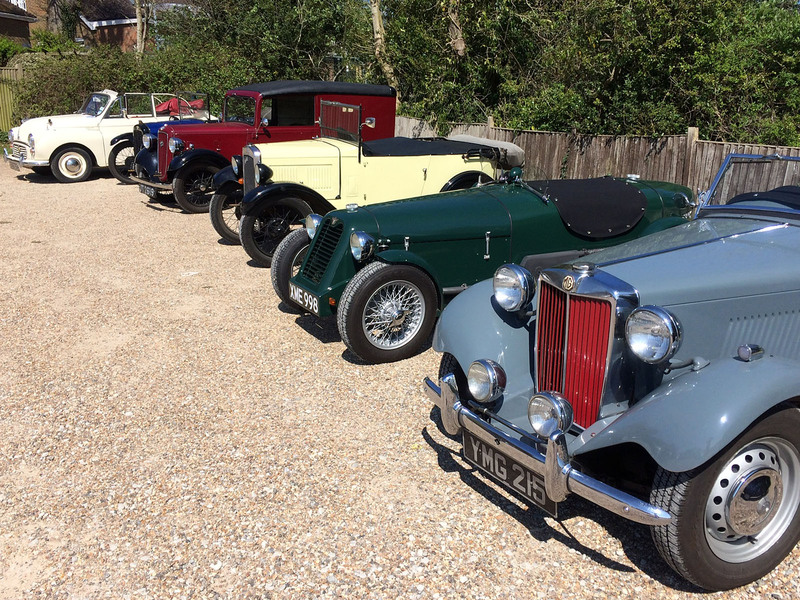 Saturday was a bright day and a wide selection of cars turned up. It was held along the quayside which was very handy for the shops and lunch. Sunday proved even busier but the weather was a little chillier. 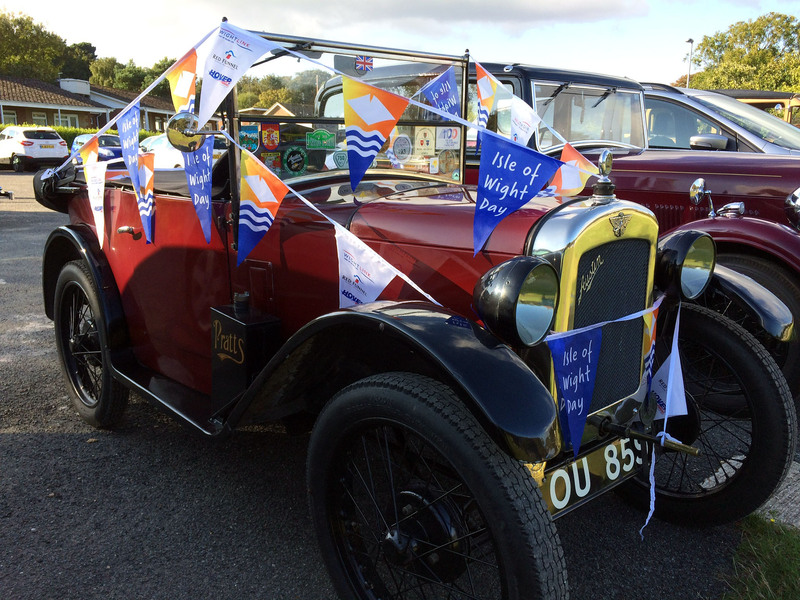 It was a very relaxing weekend and old cars were seen all over the island enjoying the views, scenery and food! 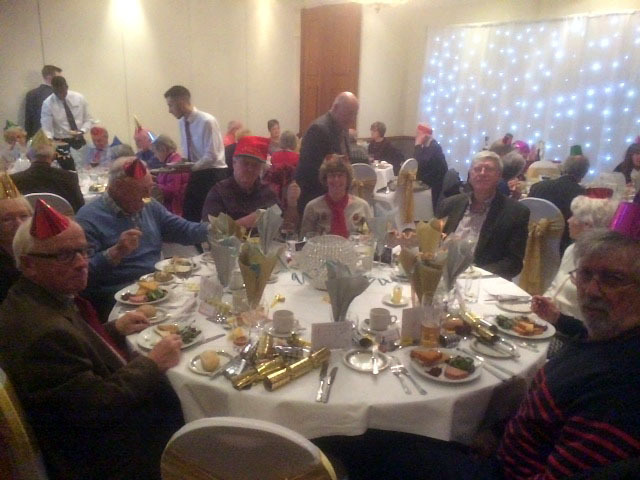 The entertainment provided in the evening was lively to say the least! It was a rock anthems weekend with a different tribute band each night. A couple of our group outdid themselves by dressing the part. And lots of us danced the night away. 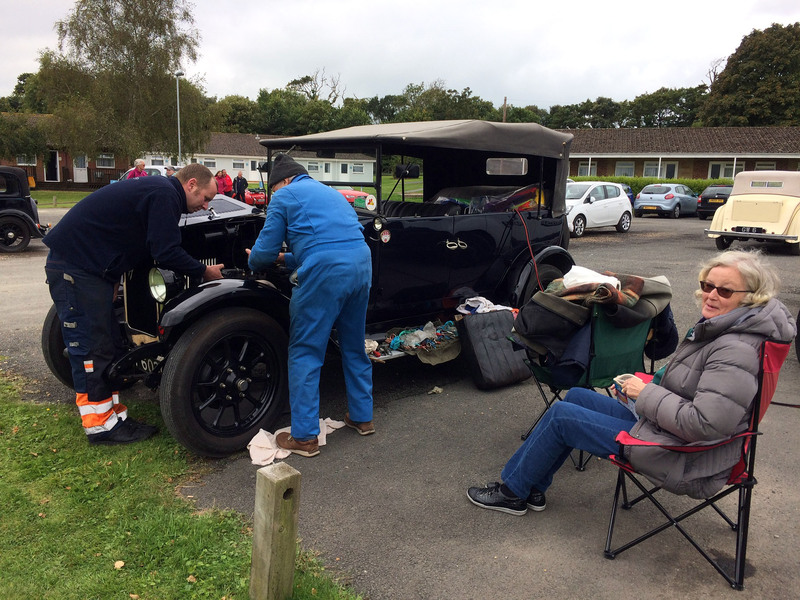 There was much jolly banter between the two car clubs everyone had a good time Thanks to Roger Horsfield for organising the event. He has the mug and tea shirt to prove it! Unfortunately Jim put his back out on the way to Portsmouth by leaning over the engine to replace the centre distibutor HT lead. Sadly he didn't see either of the car shows or any of the evening entertainment. Instead he spent a lot of time lying flat in his thankfully very comfortable chalet! Be warned - that just goes to show how dangerous old cars can be! We wish Jim a speedy recovery. Robin organised lunch and a walk in Windsor Park. 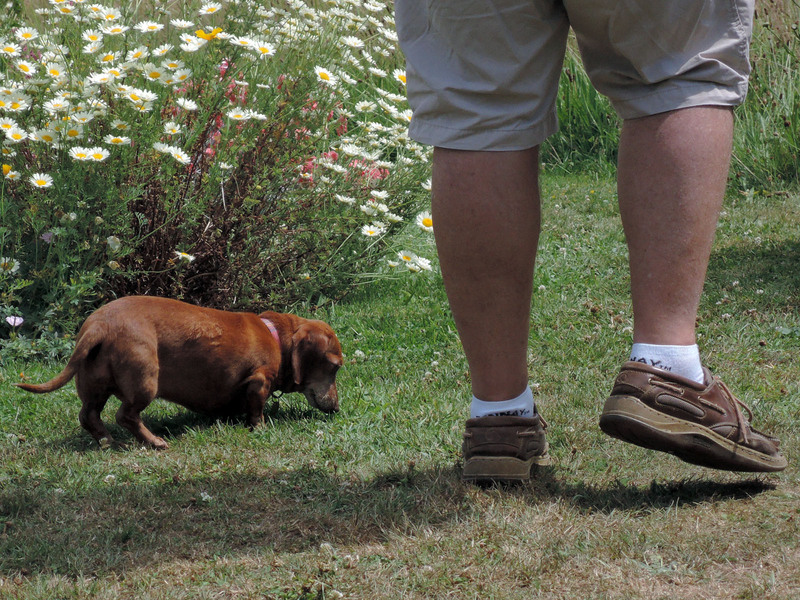 The only trouble was Robin had to, "see a man about a dog" and rushed off to Birmingham! 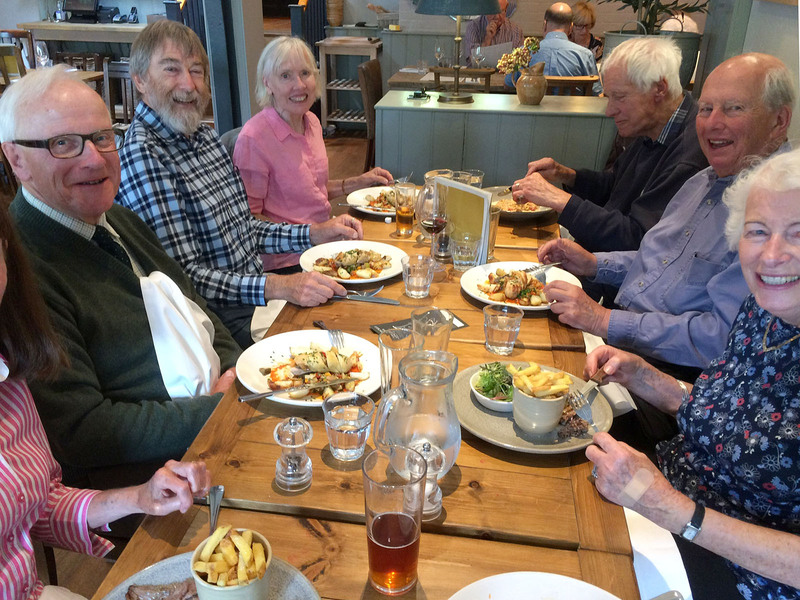 We met at the Four Horseshoes in Chobham for coffee then had a short drive to the Barley Mow at Englefield Green for a delightful lunch. 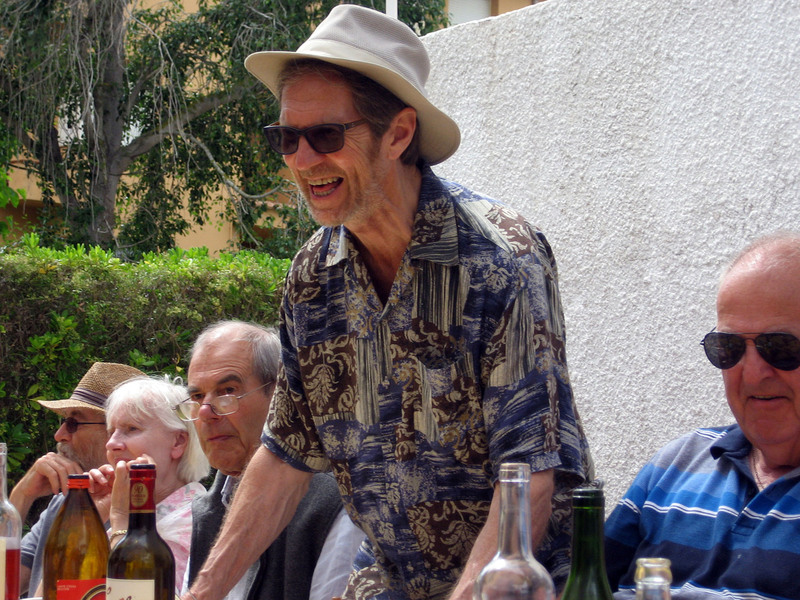 It turned out to be Jim Robinson's birthday, he assures us he is 21 +vat! After lunch we drove to Bishops Gate and walked in the Great Park. Although rather dull, Windsor Castle was clearly seen through the trees. 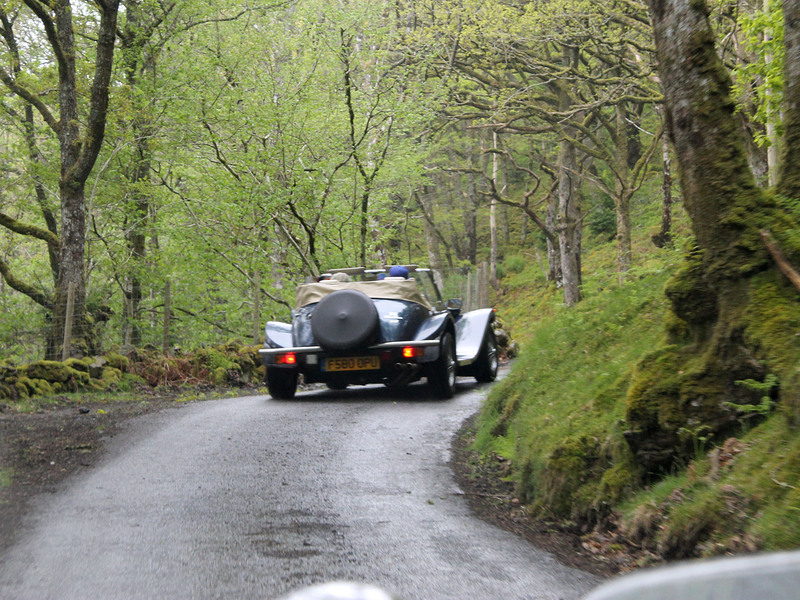 We had a lesson in bird spotting from Stephen, then drove home in time for tea. And a jolly good day it was. 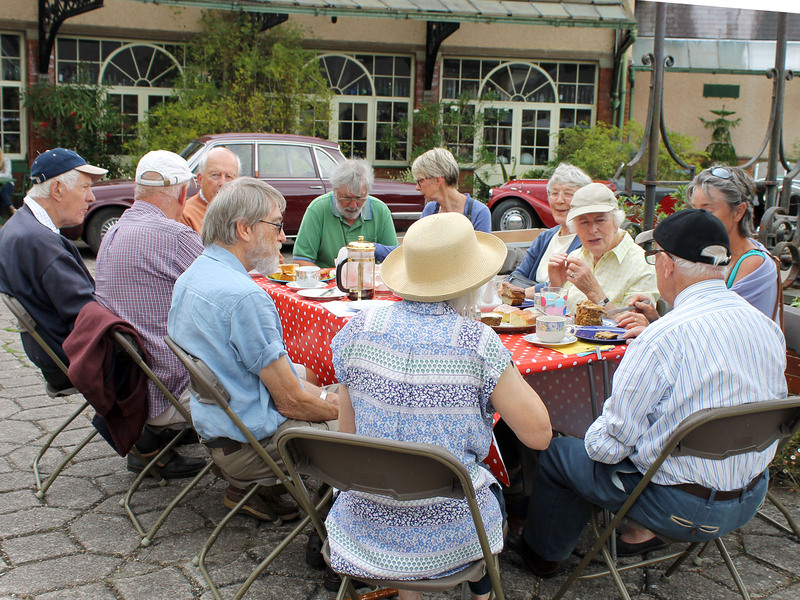 On a fine June morning Brooklands 750MC members enjoyed a pleasant drive to Knight's Garden Centre just past Godstone on the A25, meeting there for coffee at about 1100. After very good coffee and pastries, we drove the sort distance to the Barley Mow in Tandridge village where we met Marcus from the Tunbridge Wells Centre. 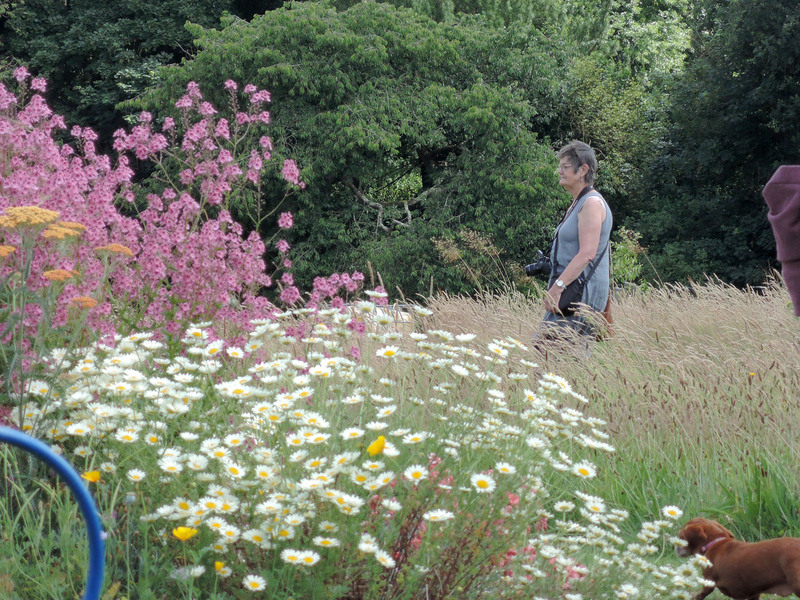 Following a good lunch it was only a few hundred yards back to the Chauffeur's Flat garden, open this day thaks to NGS. 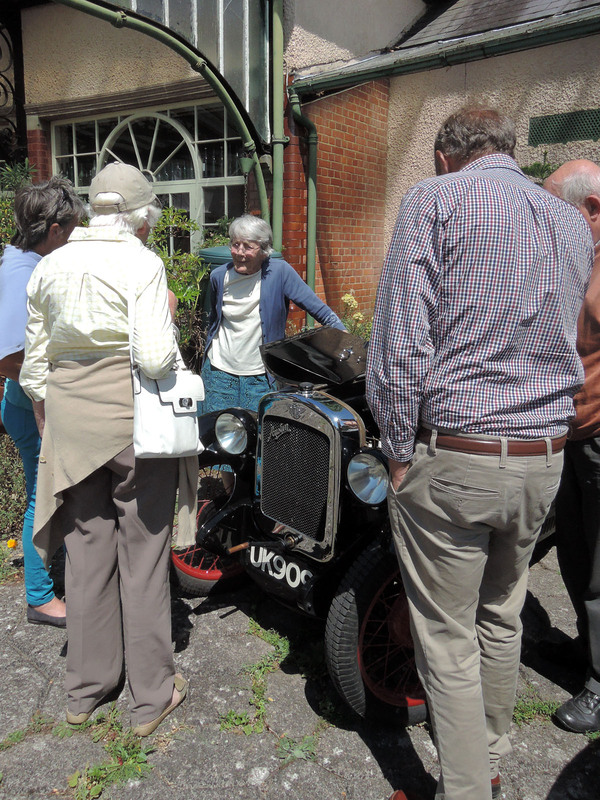 The approach is from a circular courtyard where classic cars are allowed to park. The gardens are quite small, but being at the top of a hill offer extensive views across the weald to Ashdown Forest (I think). 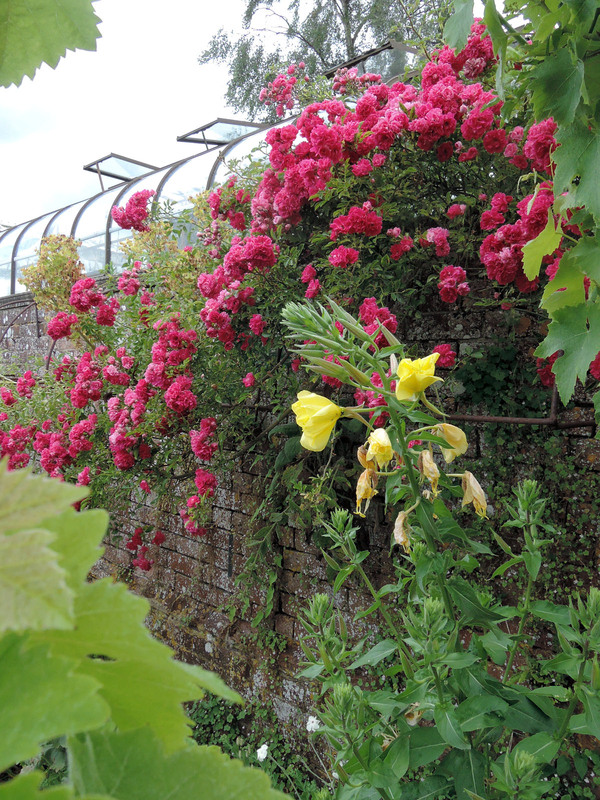 There are many distinctively planted 'garden rooms' very much at their best in June. 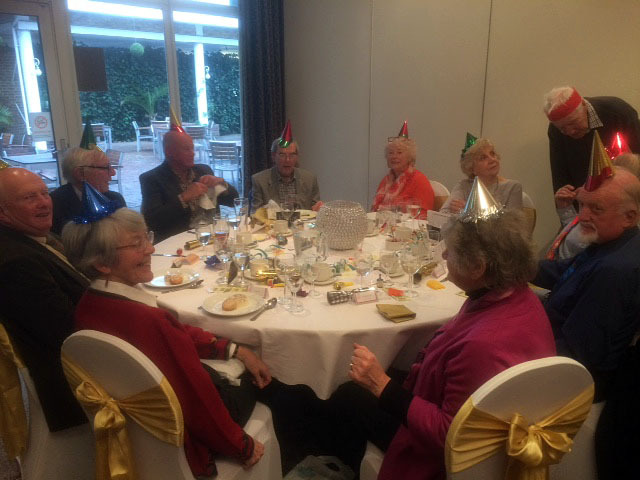 After enjoying it all at our leisure we withdrew to the courtyard where afternoon tea and cakes were partaken, and Mike, another Tunbridge Wells member joined us. 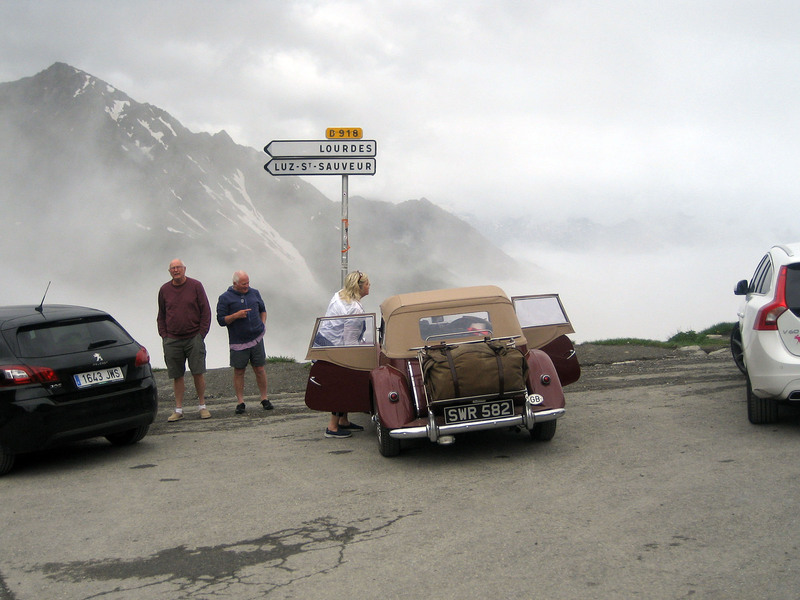 In June the Brooklands Centre sailed to Bilbao in Spain, then drove the Spanish side of the Pyrenees towards Perpignon. The drives in the mountains were spectacular and at times pretty "Hairy" to say the least. Dealing with cyclists and motorcyclists coming down the mountain at great speed was pretty terrifying and it was a relief when the group reached the very comfortable Hotel. Our destination was Callela de Parafrugal on the Catalonia coast. This is a very beautiful village and is where our friends Betty and Graham Currie have a home. We stayed in the excellent San Roch and enjoyed five days resting and taking drives along the coast. 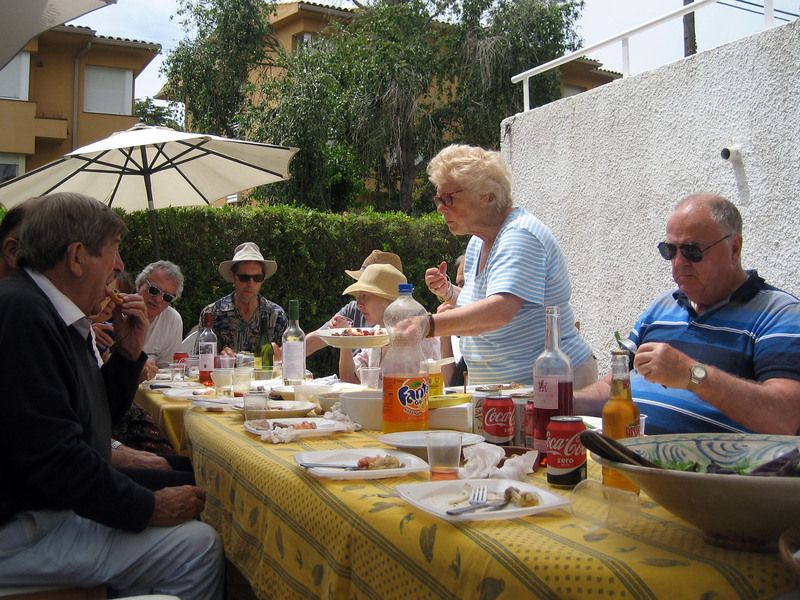 The highlight was a fabulous lunch in Betty,s garden where we all relaxed and had great fun. 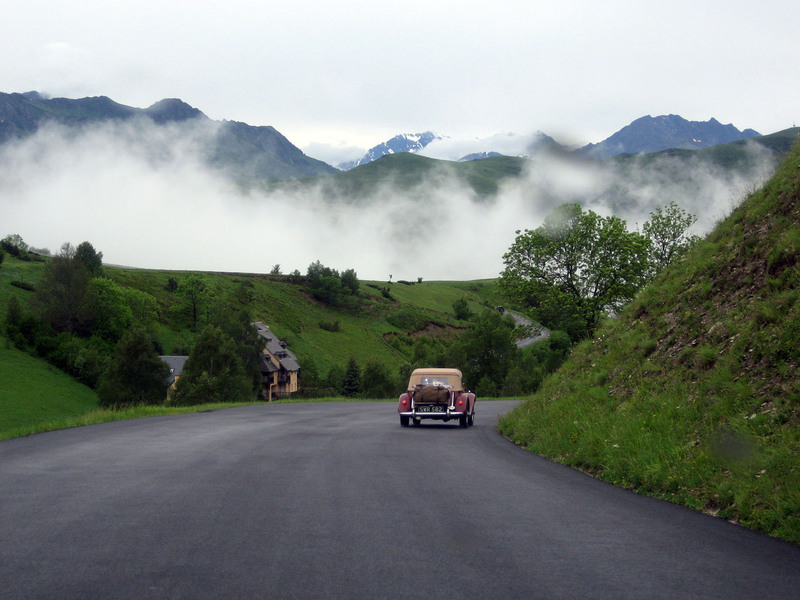 The journey back to Bilbao was along the French side of the Pyrenees where we were challenged again. 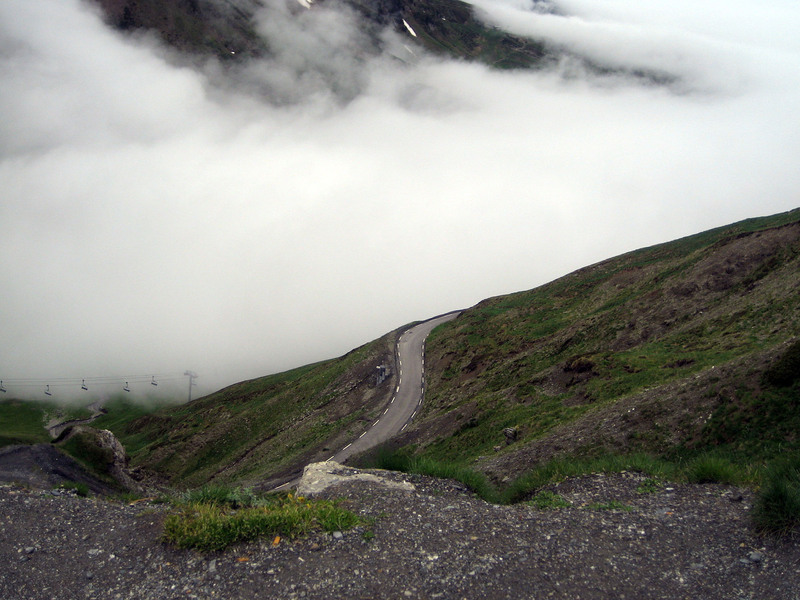 As we climbed over the mountain the cloud came down and with more or less nil visibility we crept along, following the white line in the road until it ran out at the ski station. 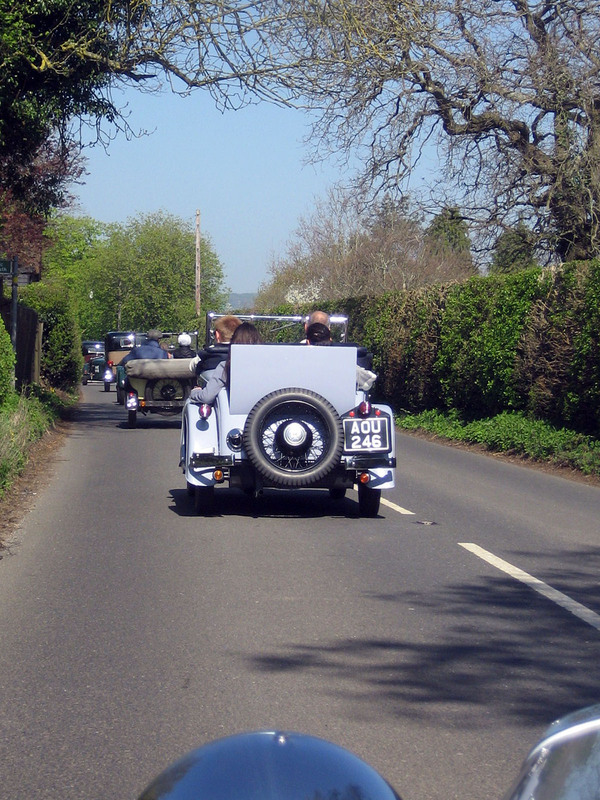 Having done the route previously in an Austin 7 I was at a disadvantage as I knew that there was a huge drop on my right hand side. Thank goodness we all survived the ordeal and at least it gave us plenty to discuss that night at Dinner. Many thanks to Robin for a spectacular Holiday and we look forward to the next one. P.S. Len and I broke down on day 1 got a hire car on day 3 and caught up but doing the holiday in a Peugeot 308 was disappointing, but we still enjoyed every moment. 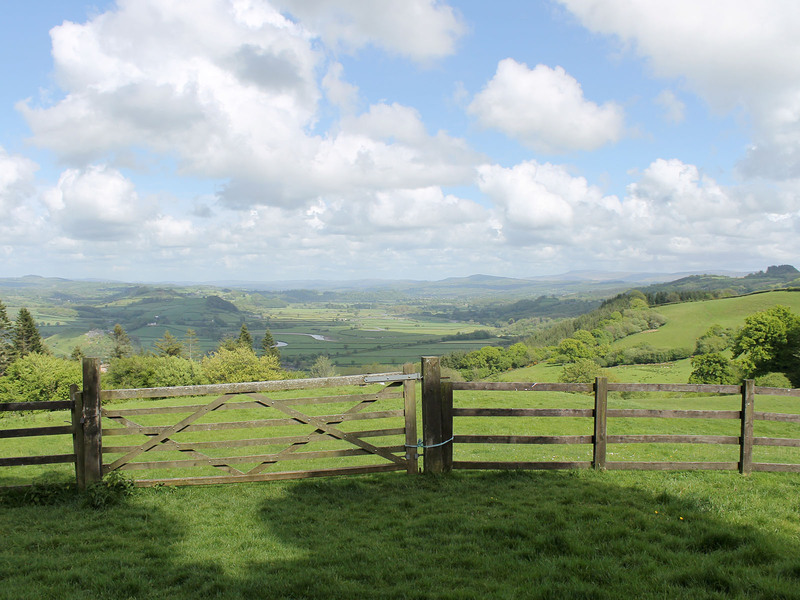 Our return to Llanachindda Farm was eagerly anticipated as we had had such a great time there in 2015. The welcome was just as warm and we settled into rooms in the Farmhouse and two cottages 23 people in total. 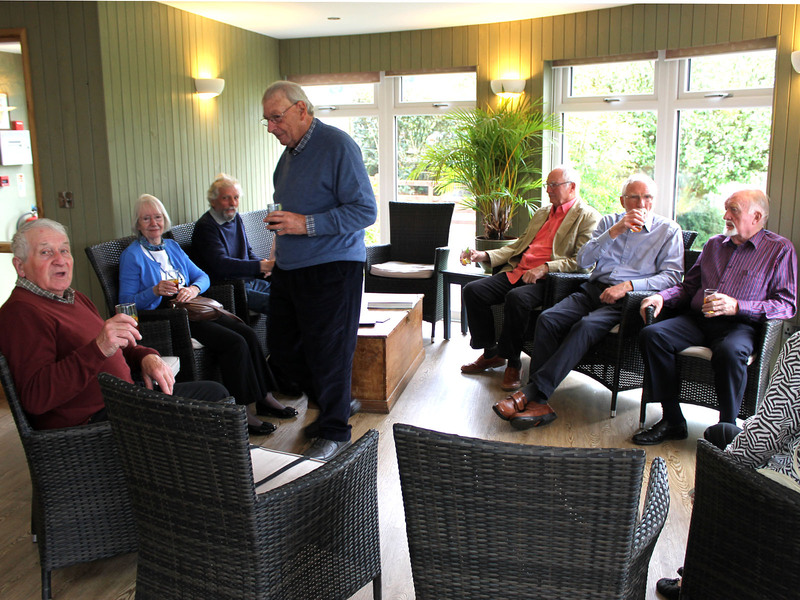 After a hearty Welsh breakfast the next day we assembled in the Conservatory for a briefing by our host Martin. We had been provided with maps and instructions for the two Day tours. 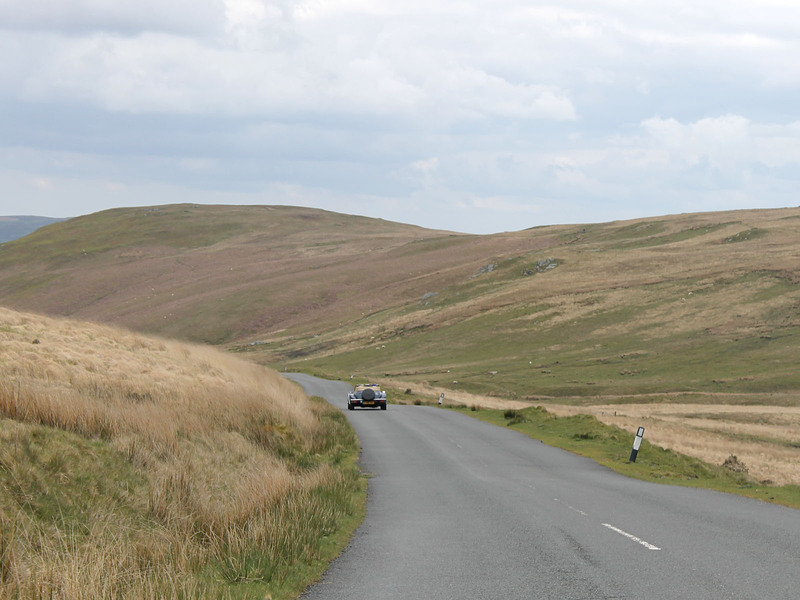 Day 1 took in the Elan Valley and Rhayader a distance of 66 miles which was spectacular and at 2pm we arrived at the Kite feeding station where a hide had been reserved by our hosts for the 3pm feeding. 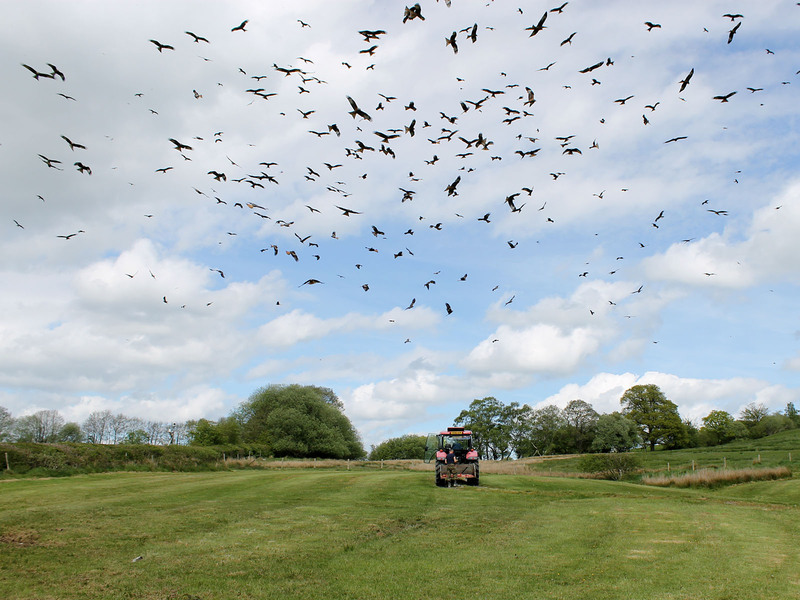 From about 2 o�clock the Kites stared to circle and by the time the tractor appeared in the field there were hundreds of Kites above us. What a sight it was fantastic and well worth a visit. 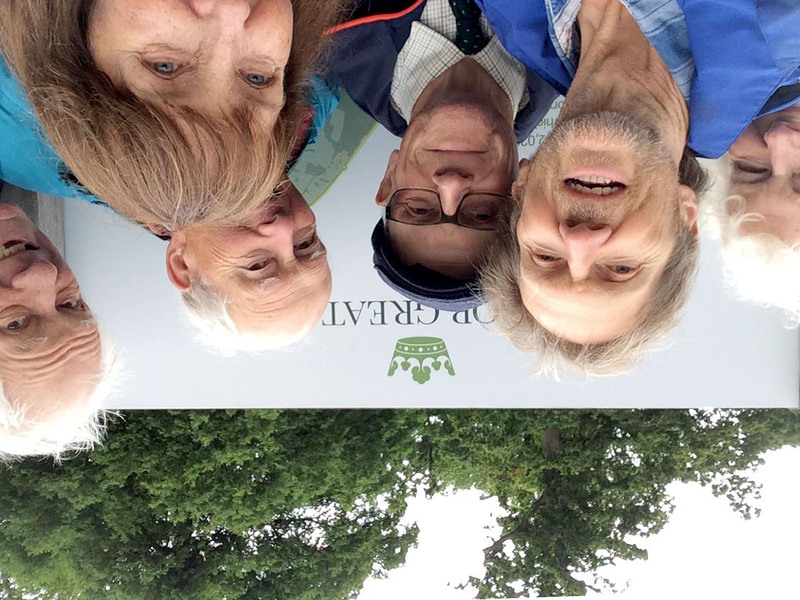 Day 2 we set off through the Brechfa Forest and the Towy Valley and ended up at the Botanic Gardens of Wales which was very impressive and beautiful. Each time we arrived at an attraction our Host martin was already there to make arrival smooth and our visit enjoyable. The attention to detail in this operation is truly impressive and the makes the �Wheels run very smoothly �indeed. Each afternoon on our return to the Farm we were greeted by Tea and coffee and homemade cakes and then at 8pm a superb three course Dinner cooked by Lynn and her son Mark. Andrew and Mark the sons of the operation were on hand for the whole weekend photographing and advising and making our stay memorable. Thank you to Martin Lynn Andrew and Mark for another wonderful stay and we look forward to a return visit maybe in 2019. 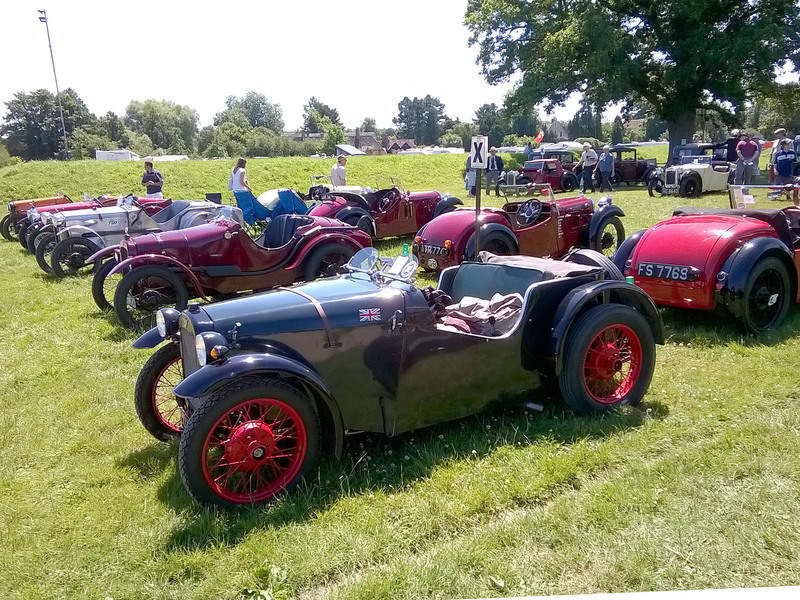 Over the weekend 1st - 2nd July,several Brooklands Club members made their way to Beaulieu for the 750MC National Rally on a beautiful sunny day. Thanks must go to Ian and the other organisers for once again setting up a very enjoyable event. 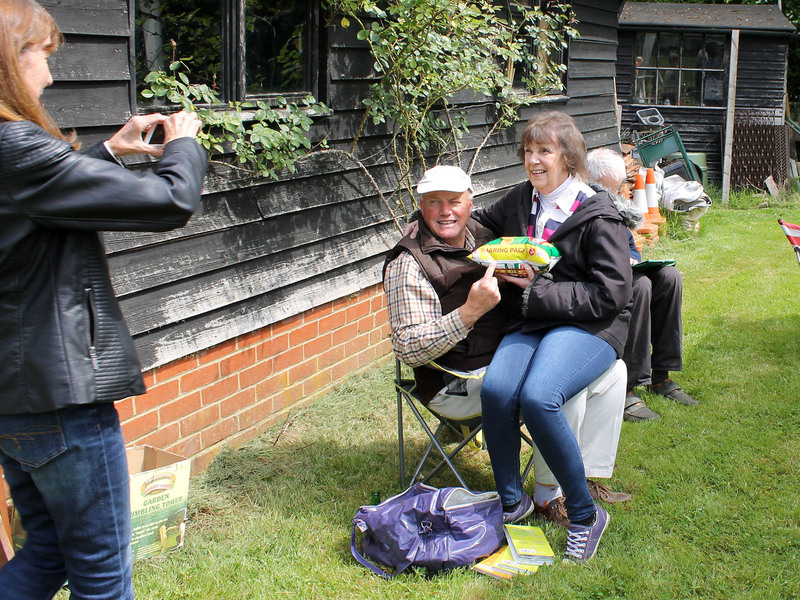 This year�s Buttercup Bounce was the 20th, so well worth celebrating. 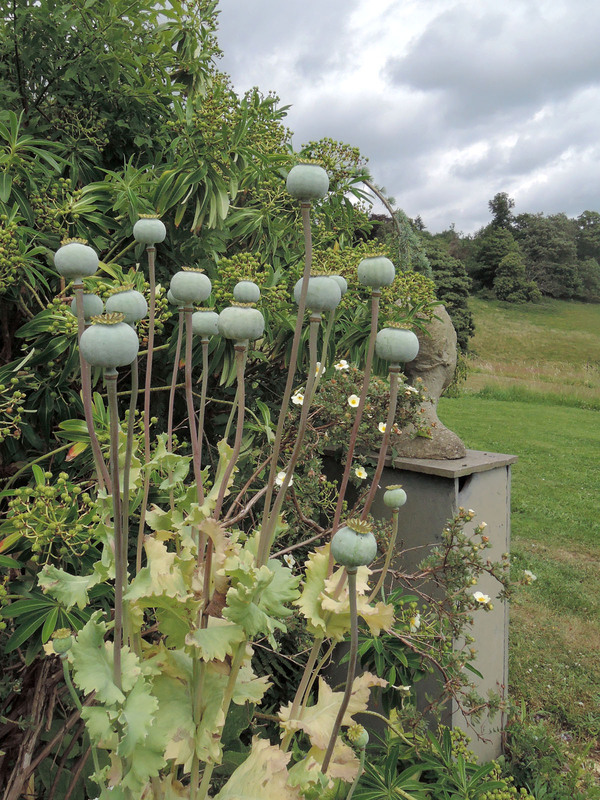 As always, it was held in the grounds of Betty and Graham Currie�s home at Ash Manor. 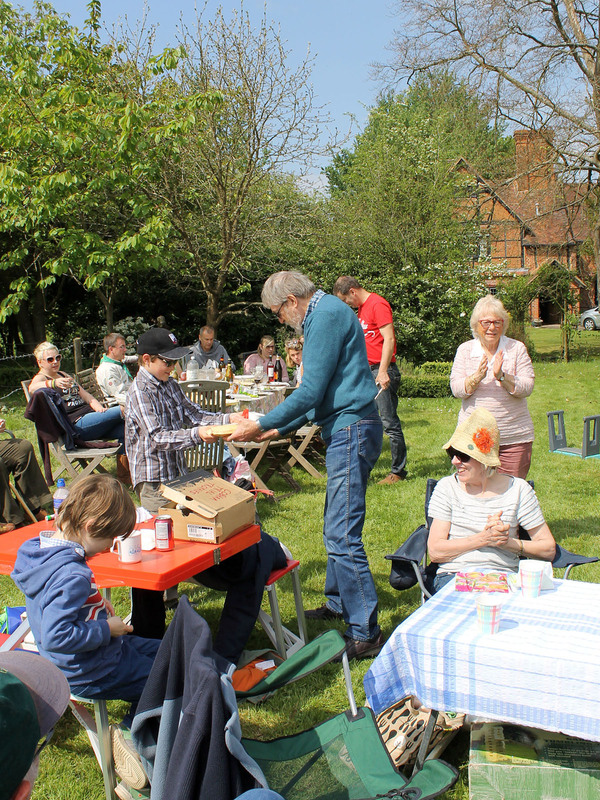 This year , after a cool start, the weather was kind and we gathered at lunchtime for picnic /BBQ. 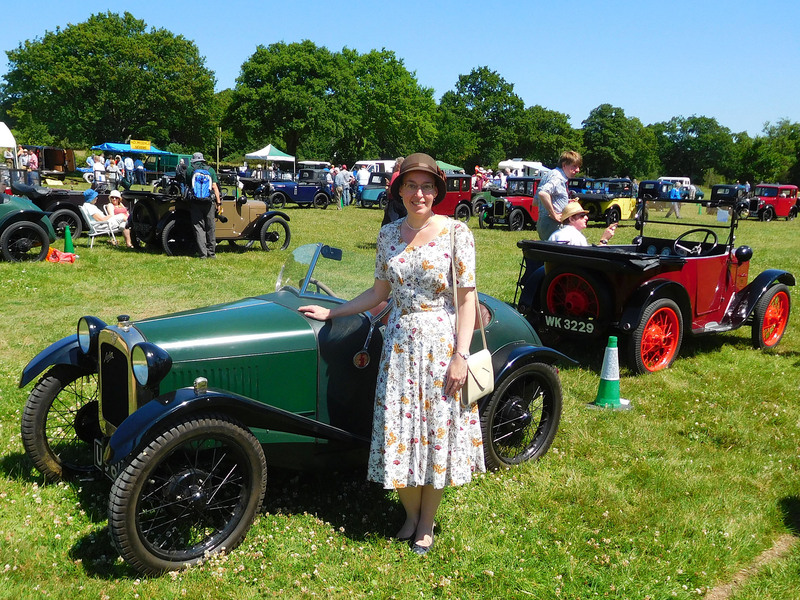 Each year we present the Bob Smith Memorial Trophy in memory of our dear friend and Committee member Bob Smith, whose Grandson Paulo chooses his favourite Austin in the line-up and does the honours with great aplomb. This year we were also pleased to welcome younger Brother Lorenzo and Father Luigi. 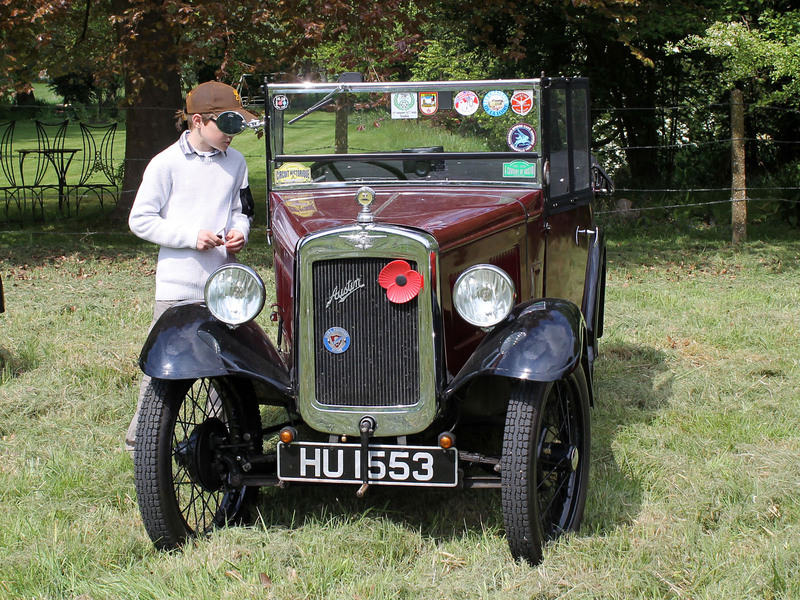 Jim Robinson's Austin 7 was judged best this year. 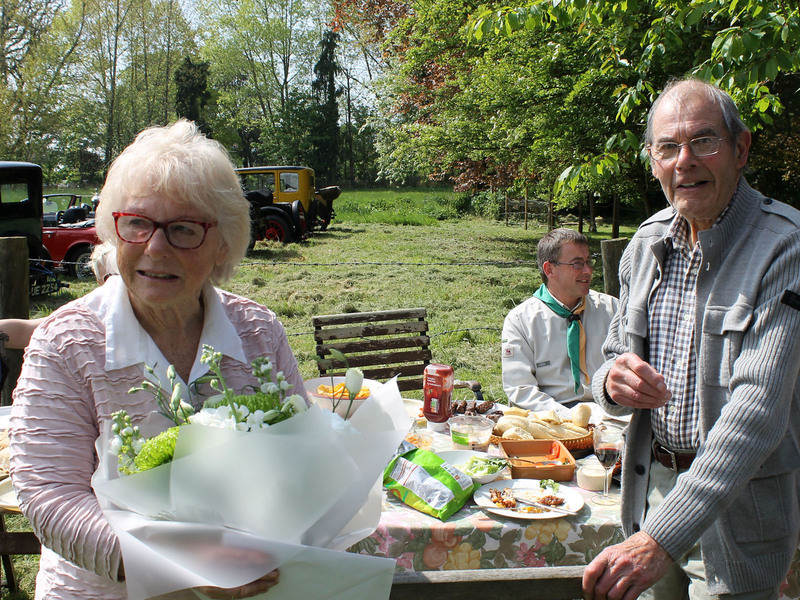 We also presented flowers and a gift to Graham and Betty to thank them for 20 years hospitality. 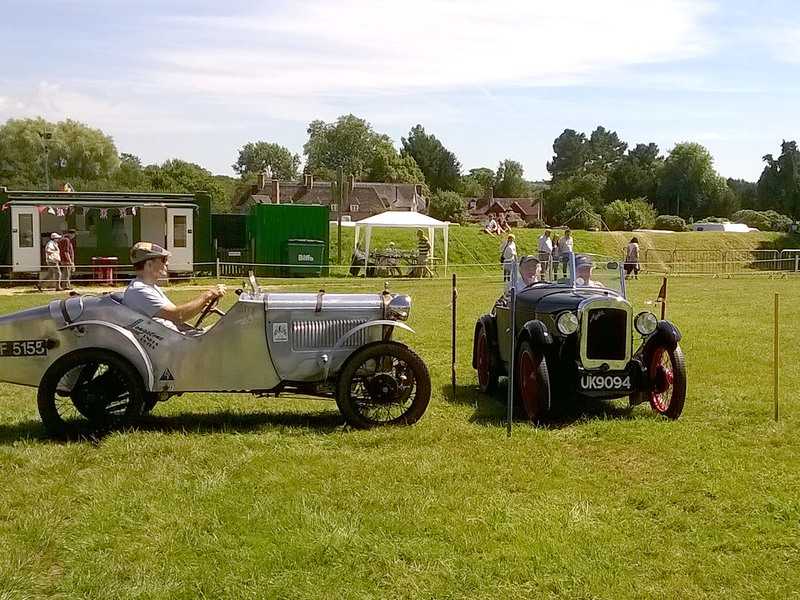 This is probably the most popular Brooklands Centre event every year. 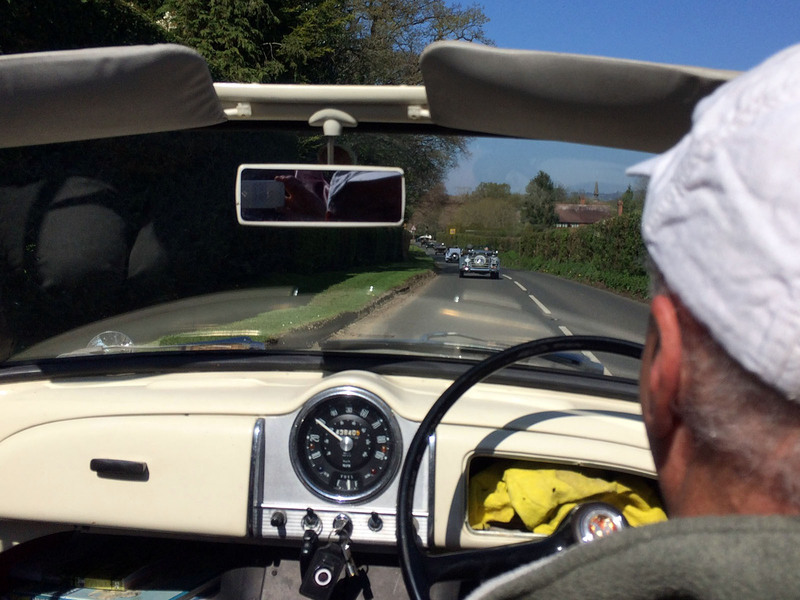 On Sunday 9th April, a few of Brooklands members joined Tunbridge Wells Centre for a lovely run and were for once blessed with spectacular spring sunshine. We met at Ide Hill for coffee in the Community Shop and set of on a beautiful run in the Kent/Sussex lanes stopping for lunch at the Mark Cross Inn near Tunbridge Wells. 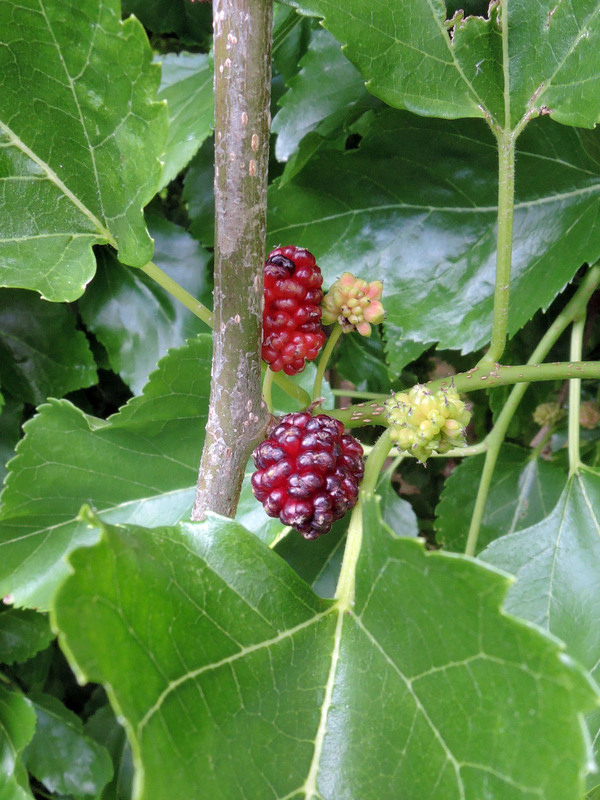 We had a super lunch in the garden with superb views of the South Downs. Many thanks to Marcus and chums of the TWC for making us so welcome.